The holidays will be here before we know it and it is a time for celebrations and parties. Just because summer is over...doesn't mean you can't enjoy pineapple flavored cocktails until next year. Nope, you can enjoy those wonderful flavors year round! With Christmas and New Years coming up...You bet I will be whipping up a few of these! Enjoy the recipe! Combine all of the above ingredients together and serve immediately. Disclosure: You must be 21 years of age or older to consume alcohol. Please drink responsibly. 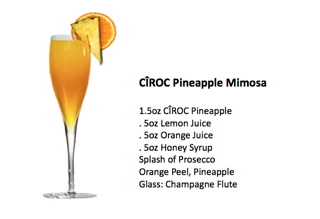 Photo and recipe is courtesy of CIROC.